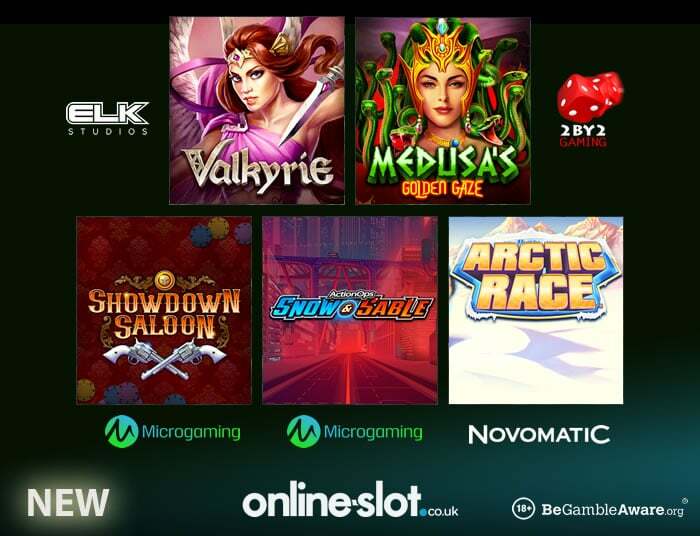 If you’re looking for a new slots to play today then you’ve got plenty of fresh releases to choose from with Arctic Race, Valkyrie, Actions Ops: Snow & Sable, Showdown and Medusa’s Golden Gaze all hitting the online casino shelves. Head to the frozen north for some husky racing in Arctic Race, a 5 reel, 243 ways to win slot from Novomatic. It might only have 1 feature, the Trophy Respin feature, but it has the potential to be a good one. Once active, you’ll receive 3 free spins where the reels feature only blanks and trophy symbols with cash values attached. Each trophy that hits delivers an instant win of up to 100 times your stake and resets the spin meter back to 3. With its simple design and gameplay, this is a typically playable Novomatic release. The Norse theme has been one of the year’s most popular with ELK Studios the latest developer to have a crack with Valkyrie. Boasting superb sound and visuals, it’s a 5 reel, 1,024 ways to win slot that comes with plenty of extras. You could randomly receive a Bonus Spin complete with added wilds, a wild reel or colossal symbols. There’s also a free spins round where the Bonus Spin extras are in play. If you like high variance action, then Valkyrie should certainly appeal as you can win 5,000 times your stake on every spin. Futuristic crime fighting is the theme on offer in Action Ops: Snow & Sable. This super volatile 5 reel, 10 payline slot has been created by Microgaming and comes with not 1 but 2 wild symbols as well as a bonus round that awards up to 20 free spins (initially) where reels 1 and 5 are wild throughout. The second new arrival from Microgaming today is Showdown Saloon. This Wild West adventure is played using a 5 reel, 10 payline machine. Central to the action are the Mystery Symbols that transform into the same matching symbol whenever they hit. Full stacks of Mystery Symbols can trigger re-spins with held symbols. There’s also a bonus round that awards up to 15 free spins complete with Mystery Symbols. Just like its stablemate Action Ops: Snow & Sable, Showdown Saloon offers volatile action. Another hugely popular theme this year has been Greek myth and legend. Medusa’s Golden Gaze retells the tale of the snake-haired Gorgon. Created by 2 By 2 Gaming, it’s a 5 reel, 25 payline slot that comes with mystery symbols, duplicating reels and a bonus round that can award up to 200 free spins with possible multipliers of up to 5x. Well designed and with a cracking bonus feature, this is an entertaining take on the ever popular Classical theme. Arctic Race, Valkyrie, Actions Ops: Snow & Sable, Showdown and Medusa’s Golden Gaze are out now. Visit the Online Slots section for all the latest releases.